U.S. Appeals Court Strikes Down North Carolina's Voter ID Law : The Two-Way The 4th U.S. Circuit Court of Appeals ruled against the state's law requiring voters to show photo identification. The court found that the Legislature had "discriminatory intent." North Carolina State University students wait in line to vote in the primaries at Pullen Community Center in Raleigh, N.C., on March 15. 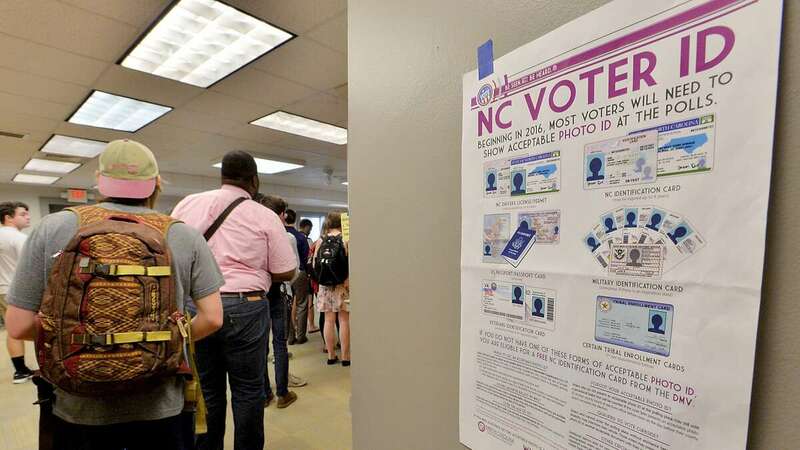 A federal appeals court has overturned North Carolina's sweeping voter ID law, ruling that the law was passed with "discriminatory intent" and was designed to impose barriers to block African-Americans from voting. The ruling came from a three-judge panel of the 4th U.S. Circuit Court of Appeals. The state is "almost certain" to appeal to the full court or to the U.S. Supreme Court, NPR's Pam Fessler reports. The law has been controversial ever since it was enacted in 2013 — "right after the Supreme Court struck down a provision of the Voting Rights Act that might have prevented the law from taking effect," as Pam has reported. "The U.S. Justice Department, the state NAACP and other advocacy groups have been fighting the changes ever since," Pam says. "They say the law discriminates against minorities and is unconstitutional. Among other things, it requires voters to show a photo ID, unless they swear they faced a 'reasonable impediment' trying to get one." "For decades in the state, black voter turnout lagged far behind white turnout. Then, in 2000, state lawmakers opened up an early voting period. In 2005, they said voters could cast ballots outside their assigned precinct. And in 2007, they enabled same-day registration. "After those changes, attorney Allison Riggs says, black voter registration and turnout surged.
" 'They had their intended effect of evening the playing field in the state, and the Legislature yanked that away,' she says." The 2013 law cuts early voting by a week, requires voters to vote in their assigned precinct and stops voters from registering and voting on the same day. This April, a federal judge ruled that the law served a "legitimate state interest" and concluded there was not sufficient evidence of discriminatory intent. That judge's opinion was hefty — 485 pages, packed with factual findings. The 4th Circuit wasn't impressed. "We appreciate and commend the [lower] court on its thoroughness," the panel wrote, but "the court seems to have missed the forest in carefully surveying the many trees." The appeals court noted that the North Carolina Legislature "requested data on the use, by race, of a number of voting practices" — then, data in hand, "enacted legislation that restricted voting and registration in five different ways, all of which disproportionately affected African Americans." The changes to the voting process "target African Americans with almost surgical precision," the circuit court wrote, and "impose cures for problems that did not exist." The appeals court suggested that the motivation was fundamentally political — a Republican legislature attempting to secure its power by blocking votes from a population likely to vote for Democrats. "But the totality of the circumstances — North Carolina's history of voting discrimination; the surge in African American voting; the legislature's knowledge that African Americans voting translated into support for one party; and the swift elimination of the tools African Americans had used to vote and imposition of a new barrier at the first opportunity to do so — cumulatively and unmistakably reveal that the General Assembly used [the 2013 law] to entrench itself. It did so by targeting voters who, based on race, were unlikely to vote for the majority party. Even if done for partisan ends, that constituted racial discrimination." As Tomsic wrote last year, what ultimately happens with this case might have implications for voting rights across the country. Earlier this summer, the 5th Circuit Court of Appeals ruled that a voter ID law in Texas had a discriminatory effect — although the judges did not rule on the question of discriminatory intent, returning the case to a lower court for reconsideration of that point.